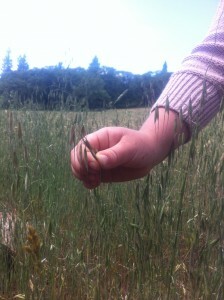 We’ve all heard of sowing your wild oats, but have you thought about harvesting them? Most of us are familiar with Avena sativa – the cultivated oat used for oatmeal and animal feed. This oatmeal grain has been shown to reduce cholesterol, blood sugar level, and risk of heart disease. But beyond its use at a food, many of the Avena species have been used by herbalists across the globe as a nutritive medicine for the nervous system. The immature seed head (often referred to as “milky oats”) and the grass stalk have both been used to treat nervous system depletion that manifests in exhaustion, depression, anxiety and/or mental confusion. The beauty of oats is that is very gentle, safe, and does not act like a stimulant that can throw depleted people over the edge. It gradually nourishes the nervous system over a period of weeks or months to help us come back into a healthier and more comfortable state of being. 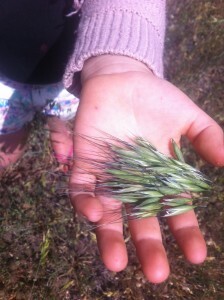 While many commercial herbal products use the same species of oats as farmers do for growing food, the wild oats appear to have very similar characteristics and are recommended by some of my favorite feral herbal teachers – Susan Weed, Kiva Rose and 7song. The wild oats varieties we typically find in the Sierra Nevada foothills are A. futua and A. barbata. Mid to late Spring is the time to harvest – I usually see the distinctive shape of the oat seed head come out in April and May (see photos). When the seed heads come out, I begin testing them to see if I can squeeze some “milk”, or the white liquid from forming seed heads. When you see a bit of that white liquid come out, that marks the best time to harvest the most potent medicine. Gather those “milky oats” and tincture them fresh for a wonderful medicine. You can still use the dried heads as well, but it’s not believed to be as potent a medicine. The great thing is, even if you miss the milky stage, you can still gather the grass stalk, known as “oat straw”. The green oat straw is high in calcium and other minerals, and it carries some of the same nourishing qualities to the nervous system as the milky oats. The oat straw makes a mild, slightly sweet tea, and I add it to my daily herbal tea blends so I am always tonifying my nervous system and getting extra calcium in my diet. If you go out and harvest this weedy wonder, be sure you have permission from the land owner, the correct plant ID, and of course gather away from the road and where it’s free from pesticides and other toxins. Process those milky oats into tincture right away (use a blender to really break up the seed heads). If you harvest the oat straw, let the stalks dry for WAY longer then you think in a brown paper bag. They are prone to molding when put in an airtight container, even when you think they are totally dried. ← Chickweed is Food & Medicine!